Aloha inspires by being different and by giving our guests an adventurous taste of our food and of the future of food. While you’re enjoying a vacation vibe and a bit of nostalgia in the former swimming paradise Tropicana, we at Aloha are innovating the food and beverage industry. We want to innovate, inspire and activate by showing it’s possible to run a successful business with healthy quality products, while taking responsibility for our planet. We experiment with new dishes and drinks. We carefully choose our products to guarantee the best flavors, while we simultaneously minimize the negative impact our choices have on our planet. We want to maximize our positive impact as much as we can, that is why we actively pursue our CSR policy and think in cycles. This means our entire team thinks about the origin, transport, packaging, use and waste of our products. To truly close the cycle, we take this a step further. We see waste as a product with value. For instance, we make ricotta for our salads with remains of milk from our coffee bar, use the fruity berry from the coffee bean as the base for our ice tea and in the future we will convert all our kitchen waste to compost which we’ll supply to urban farming initiatives in Rotterdam. For more inspiring examples, check out this section. Within this cycle we are continuously innovating to increase our positive impact on the environment even more. If we can’t close the cycle within Aloha, we look for partners who can do this together with us. Closing the cycle is the big challenge of our time, that is why Aloha established the Noblesse Oblige Foundation, by which we want to activate entrepreneurs and consumers to think in cycles. 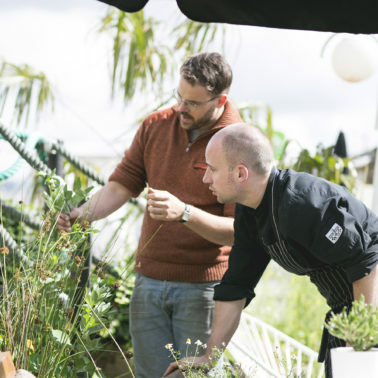 Want to see this mission explained short and easy by chefs, entrepreneurs and other key figures in the food industry? Check out the following trailer for the documentary WASTED! The Story of Food Waste. What if we can change the system in a way that waste doesn’t exist anymore. So when we think about producing food, we also think about where it comes from and what it’s next life is going to be. The Noblesse Oblige is where this change begins. Our earth is the best example of a cycle. It’s consist of infinite cycles without waste: plants and animals eat, they die and disappear into the earth to become a nutrient. Within a circular economy, the same principles apply. Everything has value and remains valuable by producing in such a way that when we no longer have use for a specific product, it becomes a valuable ingredient for another product. In case of food, we can give it back to nature as compost on which new life can grow. This natural cycle has been broken by a linear system where we take what we need to make a meal, and simply throw away leftovers from the kitchen or off of our plates. We take, we make and we throw away, but the intent to reuse and value our food is missing. When we think in cycles, the intention to reuse and value are prioritized. To go back to the natural cycle, we need more than just technical innovations. We need to innovate processes and change the way we think. This is a collective action, where we work together within the food sector and partner up with other sectors. It concerns all companies, institutions and consumers who make up our economy. Our earth is already circular, we just need to hop on again. We believe success comes with extraordinary duties and consider it our responsibility to find our way back to circular production. Big changes are possible when we step outside of our comfort zone. To do that we first need to see what our current situation is. This way we can recognize the frames and routines that determine our thinking and acting. What does food mean to us? How does it appear on your plate? What do we do with remains? These questions become even more interesting when we see them as one big question. How much do we value our food before, during and after dinner? We want to raise awareness and increase the knowledge of companies, institutions and consumers about the food cycle to create a mind shift. Aloha is our platform, where we’ll build the Waste Station of The Future. This will be an interactive corner centered around a big machine which eats waste and produces compost. We’ll use this waste station to develop tangible and interactive programs for young and old, consumers and entrepreneurs, to activate everyone to think and act circular. We don’t need to produce more, we need to act different. At Aloha we take responsibility for our guests, our staff and the world around us. We translated this responsibility into five pillars, so we can show others what we’re doing. Central to our menu are healthy products of high quality. We serve more vegetables in relation to meat and combine good food with minimal waste production. We experiment with the use of waste products from food preparations, pay attention to portion sizes and convert the remaining waste from the kitchen into compost. We buy local and seasonal products and expect our suppliers to also think about sustainability. We think and work circular. A way of thinking and acting, which we also apply to our purchasing policy. In addition to this we pay attention to portion sizes and experiment with new dishes using leftover products from food preparations. What remains is converted into value as much as possible. For instance, “Rotterzwam” uses our coffee grounds to grow oyster mushrooms, which we then use in our dishes. We make coffee-mayonaise out of unused espresso shots and waste products from our own coffee roastery. Also our interior is based on creating new value by giving furniture a second life and our floors are made out of used wood. Anything that needs repairing isn’t thrown away, instead we repair it ourselves. The catering industry is hard work. That is why we maximize working days to eight hours per shift on average, have mandatory breaks with healthy meals and give our people a gym subscription or contribute financially in other sports activities. In addition to job satisfaction, we attach much value to input and involvement. 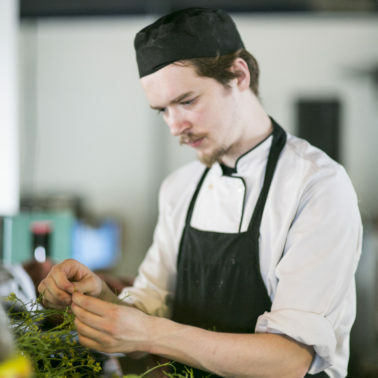 We actively pursue a diverse team with a passion for food and an eye for the future. We think collectively about how we can make Aloha more sustainable and circular, and how we can give our guests an even better Aloha experience. Everybody is welcome in Aloha and we’re working hard towards also making Aloha practically accessible for everyone. A new design for our entrance is ready, so our guest who experience difficulty walking will be able to enter Aloha. Inside, our guests can choose from a big variety of seating on different levels, with or without armrests. Together we can make our world a better place. That is why Aloha values a good relationship with our surroundings. We organize thinktank sessions on sustainability with outside parties and talk to students interested in supporting sustainability. They inspire us, and we in turn hope to inspire them. Finally, we also do volunteer work, among other places at the Voedseltuin. Since 2015 we’ve proudly been part of Blue City [LINK], where waste isn’t simply an end product. At Blue City we believe that waste has value, as it does in nature. Just like Aloha, all entrepreneurs in Blue City are occupied with cyclical production. Within the building we experiment together, so we can discover new ways to adjust or combine our production processes to one another. We do this so we can create one giant cycle, where one entrepreneurs waste is another entrepreneurs ingredient for a product. 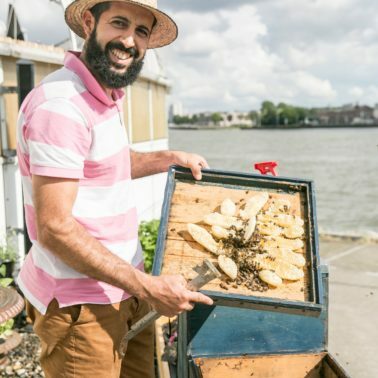 An example of this is the way in which Rotterzwam uses our coffee grounds and coffee bean husks to grow oyster mushrooms, which we use in our Dutch “bitterballs” and serve with coffee mayonnaise! Want to know more about circular economy? This video has a short and clear explanation. 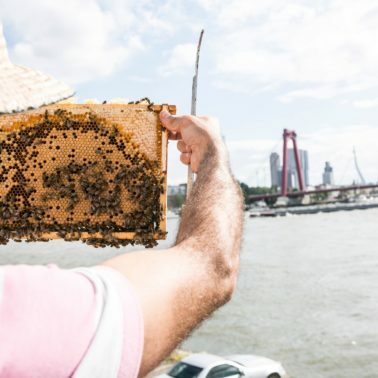 On our terrace we have a bee garden, in collaboration with our city’s beekeeper Bouna. The honey is used in our kitchen and our teas. The cabinet maker uses the beeswax in his furniture, made of wood waste, which he supplies to Blue City among many offices. At the moment we collect our kitchen waste in Hungry Bins, where worms turn the food waste into high quality compost. Which doesn’t only cut the costs for disposal, but we use the compost to fertilize our kitchen garden, supply it to other entrepreneurs within Blue City and use the moisture from the compost as a natural superfood for our plantation. 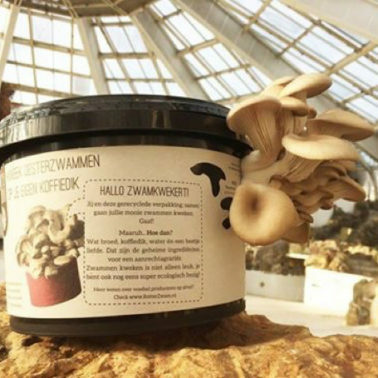 The company Rotterzwam in Blue City grows their oyster mushrooms on coffee grounds and coffee bean husks coming from our coffee roastery. At Aloha we then use these oyster mushrooms to make the classical Dutch Bitterballs, with a twist. 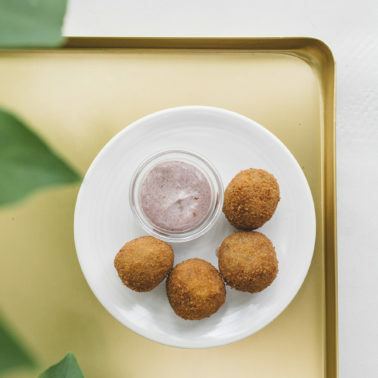 Also, we serve them with coffee mayonnaise, made of leftover espresso shots from the bar and coffee waste from our roastery. Next to oyster mushrooms growing on our coffee grounds and making coffee mayonnaise from leftover espresso shots, we do a lot more with our coffee waste. We cook with cascara, the hull that surrounds the coffee berry. 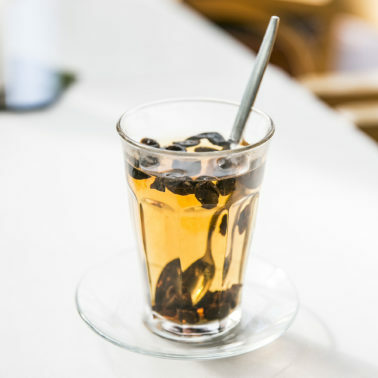 Cascara contains sugar and has a fruity flavour. We sell it to make tea, use it as a replacement for sugar in our cocktails and homemade sodas and our chefs enjoy cooking with it. 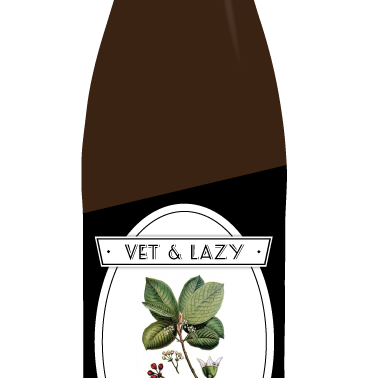 Together with beer brewery Vet & Lazy we even made our own beer: Cascara White Stout. A fresh beer with the fruitiness from our cascara and the deep dark flavours from our coffee.